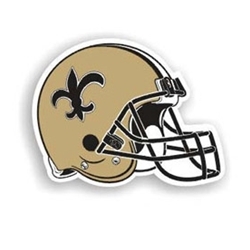 Attach your team pride to any metal surface with this large 12" New Orleans Saints Magnet. Team magnet is a great way to show your Saints pride on your car, refrigerator or any metal surface. Our Saints magnet, which sports the Saints logo, is made of a heavy gauge magnetic vinyl making it perfect to withstand the toughest competition of weather. Order Today!